Happy New Year Westheimer Estates! 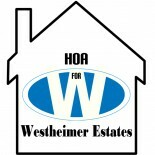 | Homeowners Association for Westheimer Estates, Inc. This entry was posted on January 1, 2013 by Westheimer Estates in HOA and tagged 2013, community, Happy New Year, joy and happiness, prayers and wishes.